After completing our long sail north from Miami, FL to Jersey City, NJ, we'll arrive at our new marina--situated on the Hudson River directly across from lower Manhattan. This pic doesn't begin to do the view justice. See that bright object in the photo? That is the sun reflecting off One World Trade Center. What you are unable to see in the photo is everything situated just south of the marina--the Statue of Liberty, Liberty State Park, and Ellis Island. Depending on our slip, our view could be quite spectacular. 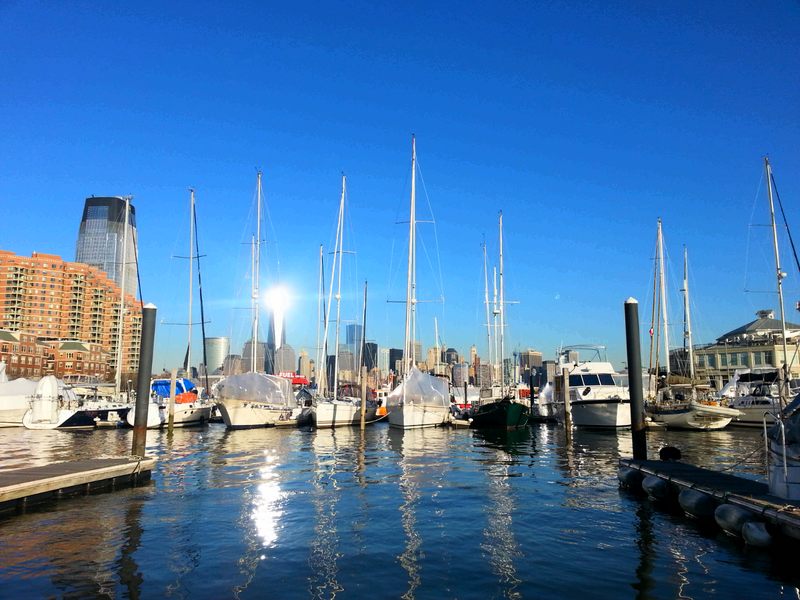 We found out about this marina during a trip we took to New York City earlier this year. While there, we stopped by this very marina to catch a water taxi. We happened to visit on an extremely cold day (single digits), and being that it was the dead of winter, we didn't expect to see many (if any) boats in the water. Much to our surprise, however, we found a marina full of boats--including two Gulfstars! We'll be right at home.